It was from my dad that I got this collecting interest on coins. My dad, a coin collector also, would bring me to coin conventions during the 70s. My first coin was a large 1903 US Philippine silver coin. I was fascinated by the inscription on the coin - FILIPINAS on the obverse and UNITED STATES OF AMERICA on the reverse. At that time the Philippines was under the USA government which explains the inscription. This was the 1st Philippine coin that I collected. My dad gave this to me when I was 10 years old. One of the most interesting things about Philippine coins come from the amount of times that they are changed. One can easily tell the era it was produced by just looking at the design of a particular coin. Coins are also easier to find, simply because they are known to last longer than paper money. There are both inexpensive and rare, expensive coins to collect. 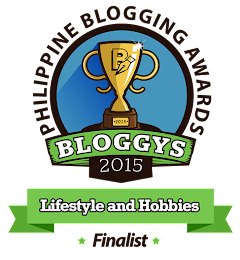 Know that you have a wide variety of options in collecting Philippine coins. One can collect Colonial coins, Spanish Philippine Coins, Philippine American coins, Culion coins, and Philippine Republic coins, you just have to know which particular era would interest you most. 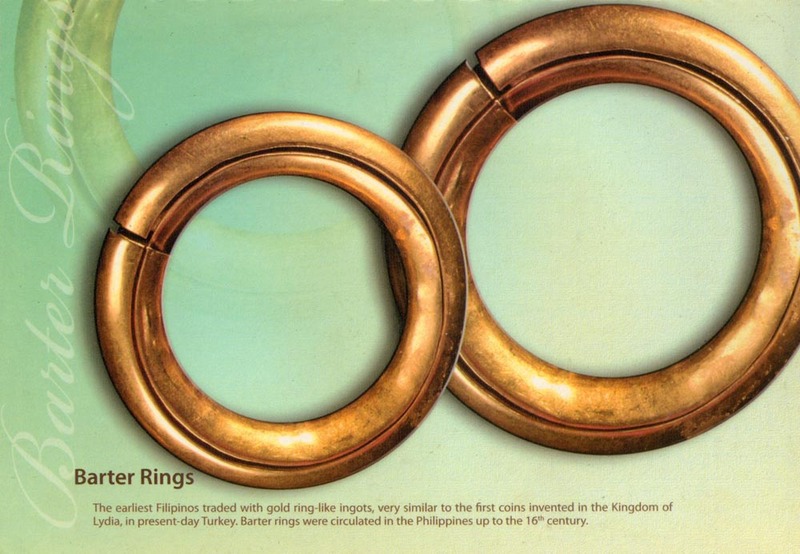 The Philippines' first coin was the Penniform Gold Barter Ring that the country adapted. This coin is believed to have been circulated between the eighth and the 14th centuries. 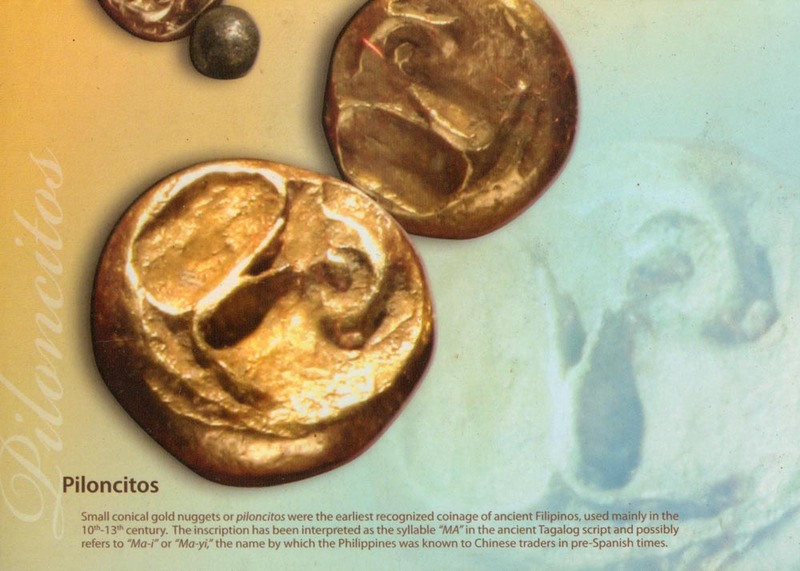 Specimens of varisized gold artifacts resembling this type have been recovered from many archaeological sites in Laguna, R izal, Mindoro, Cebu, Leyte and Bohol together with 12th- 14th-century Oriental ceramic tradewares. These gold rings were probably used by the Filipinos' ancestors in trading with the Chinese. A coin in the form of a small conical gold nugget, called the piloncito, appeared next. On its flat base was an embossed inscription, which some scholars say is the character Ma, or the letter M, in the ancient Tagalog script. With the Spaniards, who arrived in the early 16th century, came the coins of Spain and Mexico. 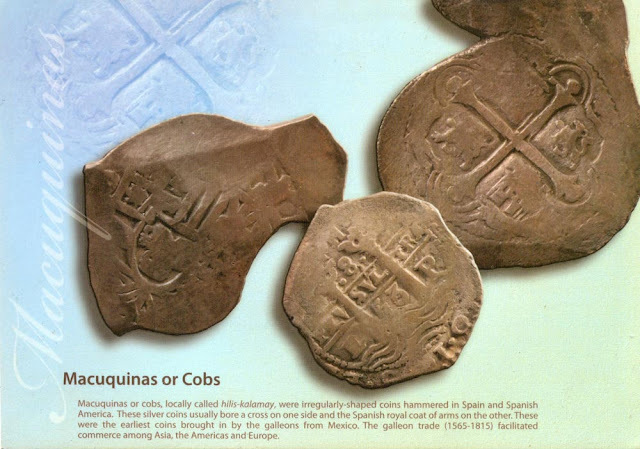 Local currency took in the minted cobs of various polygonal shapes, known locally as hilis kalamay, the round- milled coins that bore portraits of Spanish monarchs, and the beautiful Mexican silver Pillar Dollar, or Dos Mundos, which were predominantly used in many parts of the world. 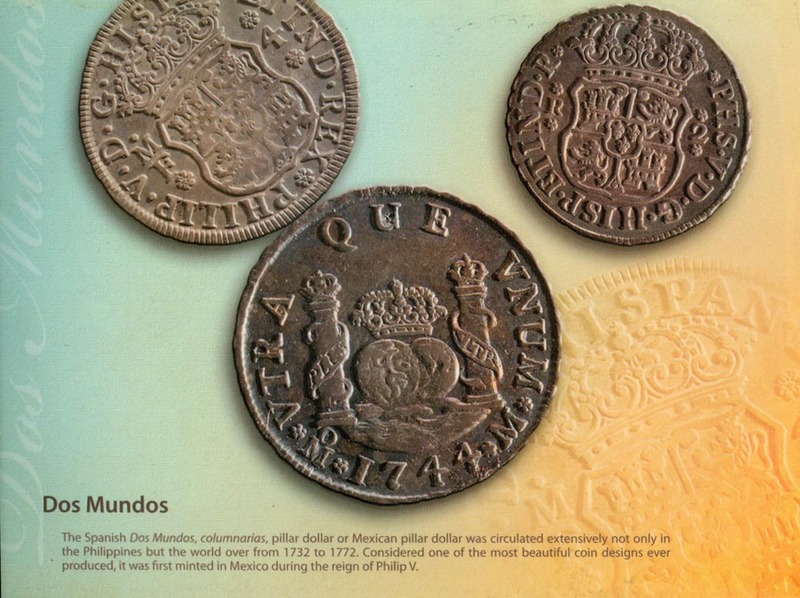 The Dos Mundos was highly regarded for the integrity of its silver content and weight. The barilla is believed to have been the first coin struck in the Philippines. This was a crude brass coin approximately equivalent to one centavo. Available specimens show the inscription on the outer edge - Barilla, Ano de 1728 - and the coat of arms of the City of Manila in the inner circle. In 1766 a second type of barilla, made of copper, about half the size of the first Spanish barilla, appeared. 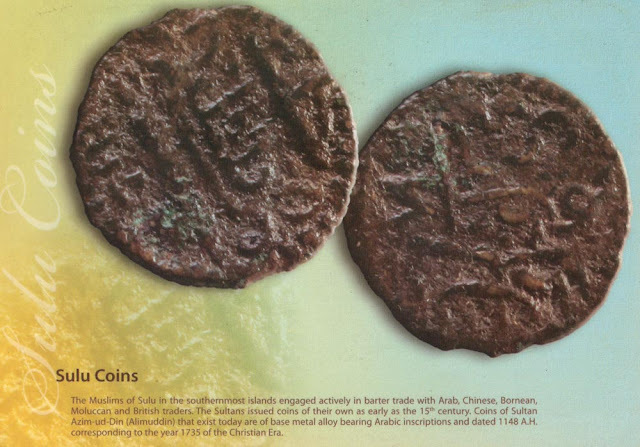 The Tagalog, like the Mexicans, pronounced the double / as y, and small coins, or change, came to be known as barya. 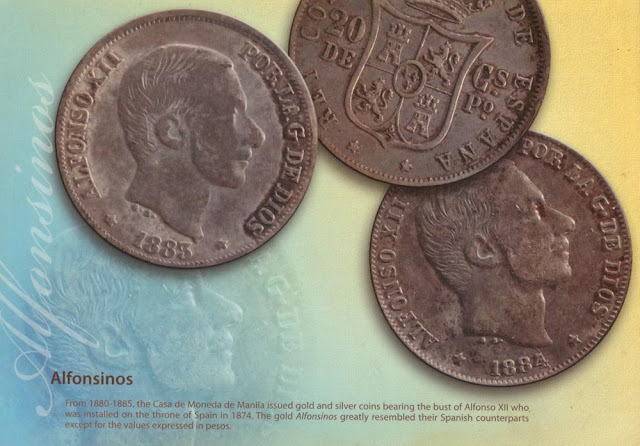 Other coins used in the country between 1782 and 1835 were varieties of the octavo and the quarto, bearing the names of Spanish rulers and the coat of arms of Spain. Eight octavos, or four quartos, were equivalent to one real; and the eight reales equaled one peso. After 1810 a variety of new coins struck by the colonies of Spain in Central and South America that became the independent states of Mexico, Peru, Bolivia, Chile and Argentina reached the Philippines through the galleon trade. 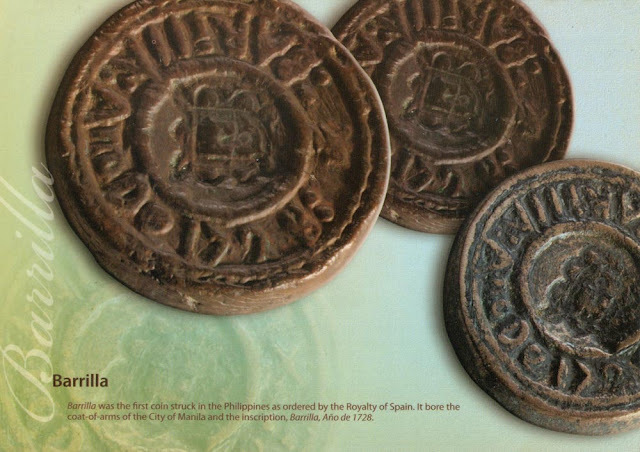 The Spanish authorities in Manila feared the possible effects of these coins on the Filipinos and tried to stamp out traces of their origin. 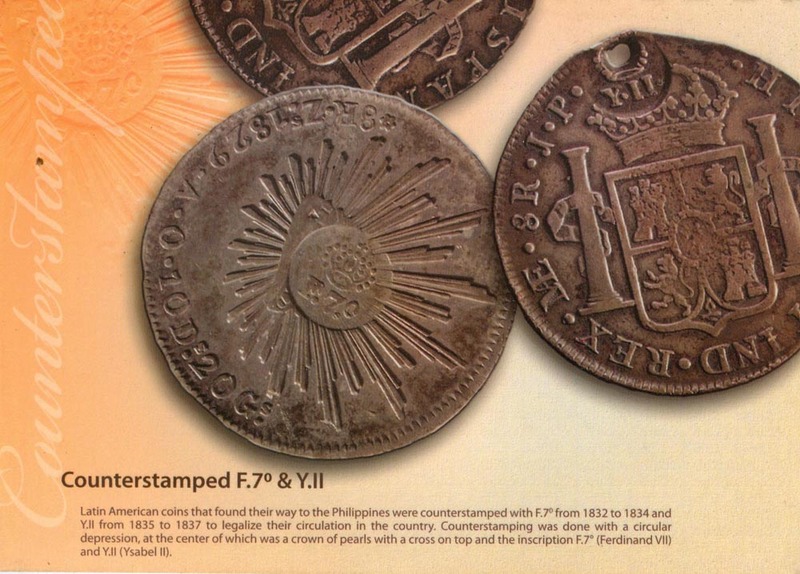 Governor General Mariano Ricafort on October 13, 1828, decreed that all coins from the insurgent colonies be counter- struck on the obverse side with Spain's coat of arms and at the center of the reverse side with the inscription Manila and, underneath, 1828. The Manila overstrike continued until 1830. In 1832 the new counterstamp was in the form of a small circular depression within which was a crown of pearls and the initials F. 7°, for King Ferdinand VII. This counter- mark was changed to Y. " upon the accession of Ferdinand's daughter Queen Isabella II in 1834. The counterstamping was stopped by an edict on March 31, 1837, when Spain began to recognize her former Latin American colonies as independent states. During the reign of Queen Isabella II a royal mint was established in Manila. It was founded pursuant to a decree issued in 1857, but mint operations did not begin until 1861. One of the officials was Don Antonio Garcia, whose grandson was the late Adolfo Garcia, a prewar engraver. 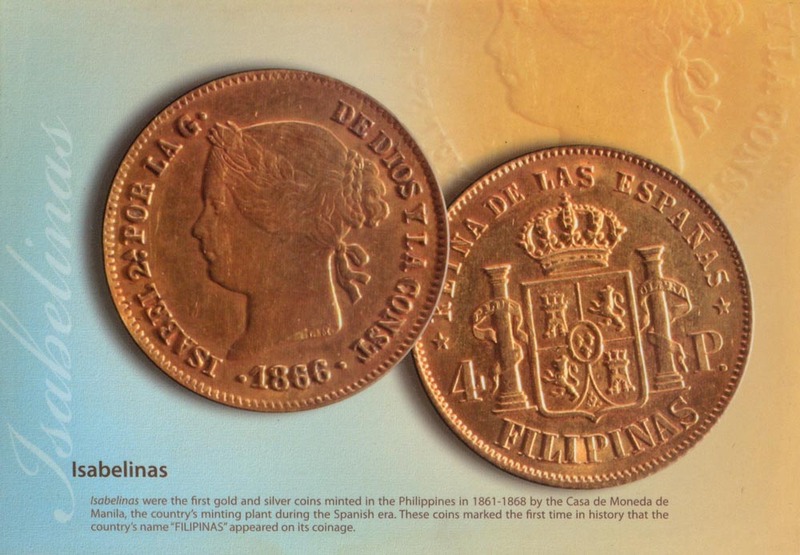 The Philippine mint initially struck four-peso, two-peso and one-peso gold coins bearing the bust of Queen Isabella II and on the reverse side the inscription FILIPINAS.By 1864 the mint produced silver coins of minor denominations - 50, I, 20 and ten centavos de peso, with portraits of Queen Isabella II and later of King Alfonso XII. The Alfonso XII coins were not liked by the people and the government had to resume the minting of the lsabelinas. Some of these were dated 1868, although lsabelinas were coined from 1886 until the coming of the Americans, in 1898. 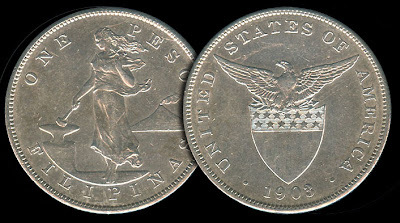 The Philippine mint did not, however, strike any coins of the eight-reales size. Some six million silver pesos were struck in the Madrid mint for exclusive use in the Philippines. 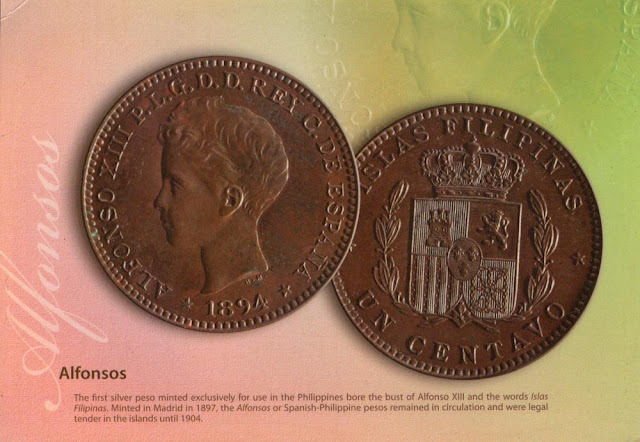 The 1897 UN PESO bore the profile of the young Alfonso XIII, with the reverse side marked ISLAS FILIPINAS. The Spanish-American war caused the abrupt termination of Alfonso's rule over the Philippines. As a result the 1897 large-peso coins were circulated only until 1904. U.S. Civil Governor William H. Taft declared the large peso no longer legal tender after September 30 of that year. The Philippine Insurrection in 1896 resulted in the proclamation of the First Philippine Republic on June 12,1898. General Emilio Aguinaldo, who was elected president, immediately took steps to adopt a national coinage and currency system. Existing specimens reveal two different types of two centimos de peso made of copper, reportedly struck in the military arsenal in Malolos, Bulacan, in 1899. With the surrender of General Aguinaldo these were withdrawn from circulation and declared illegal. When the United States of America conquered the Philippines at the turn of the century an orderly monetary system was instituted for the country by an act of the U.S. Congress, approved on March 2, 1903. The act provided for the minting of silver one-peso coins and smaller denominations of 50, 20 and ten centavos. 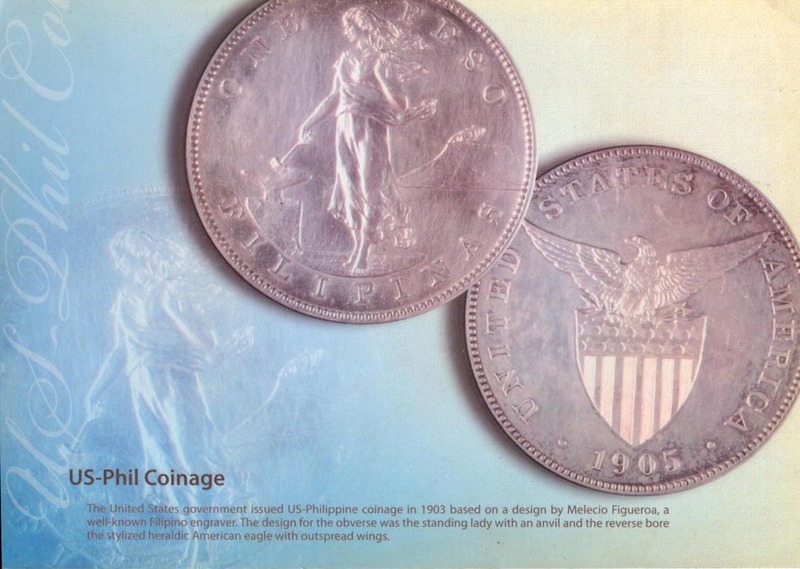 The U.S. - Filipinas coins were designed by Melecio Figueroa, a Filipino 'artist living in California, and struck in the U.S. Bureau of the Mint. The silver coins minted between 1903 and 1906 contained .900 fine silver. The price of silver rose sharply in 1906, resulting in the reduction from 1907 to 1912 of peso pieces to .800 fine silver, with diminished size and weight. The minor coins were reduced to .750 fine silver. The continued rise in silver prices eventually resulted in a complete halt of silver-peso coinage. The copper-nickel five-centavo, the bronze one-centavo, and the bronze half-centavo coins were not altered. The half-centavo coins soon became unnecessary and were permanently removed from circulation by March 1904. The blanks and the remaining idle pieces were recoined into one-centavo pieces. All U.S. - Philippine coins of regular issue were minted in the United States until 1919. In 1920, 1921 and 1922 minor coins were struck in the Manila mint. In 1923 and 1924 no coins were struck. Then the Manila mint reopened in 1925. All regular commemorative issues were struck with the mint-mark M until 1941, when the Manila mint was destroyed by the Japanese forces. All coins made between 1944 and 1946 were again manufactured in the U.S. mints in San Francisco, Philadelphia and Denver. 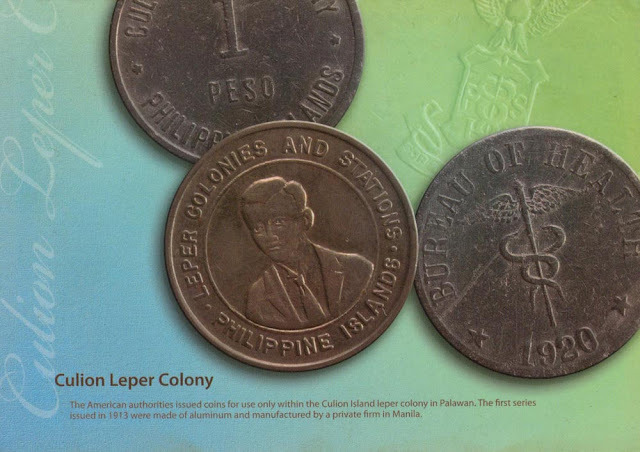 The U.S. - Philippine coins continued to be in use even after the Philippines gained her independence from America, in 1946. 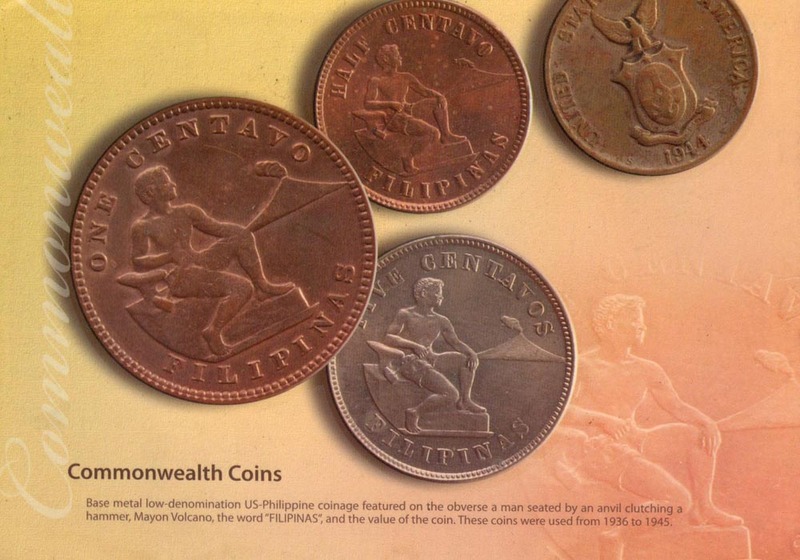 The new coins for the Republic of the Philippines were struck in the Philadelphia mint in 1958 to replace the worn-out small-size Central Bank notes. The design on the obverse side of the U.S. - Philippine coin was adopted, while the reverse side carried the Republic's coat of arms. A new 25-centavo coin was substituted for the 20-centavo piece, while the one-, five-, ten- and 50-centavo coins were made approximately the same sizes as those of their U.S. counterparts. Subsequent issues of the minor Republic coins were manufactured annually from 1959 to 1963 by the U.S. Bureau of the Mint. The Royal Mint of England minted the 1964 issues. In 1966 the coins were struck by the Vereinigte Deutsche Mettalwerke, in Alpena, West Germany. Major changes came about with the growing nationalism in the country. In 1967 and 1968 the Filipinization movement affected even the Republic's coinage and currency system. The new coins in Filipino are in denominations of one sentimo (centavo), five, ten, 25 and 50 sentimos, with the obverse sides bearing the portraits of Filipino heroes-Lapulapu, Melchora Aquino, Francisco Baltazar, Juan Luna and Marcelo H. del Pilar. The reverse side of each coin bears the seal of the Republic of the Philippines at the center, inscribed with REPUBLIKA NG PILIPINAS along the edge. The first four minor coins are dated 1967, but the 50 sentimos bears the date 1968. These coins were manufactured annually until 1972 by the U.S.Bureau of the Mint. In 1972 an additional 20,000,000 of the 50 sentimos were made by the Chartered Industries of Singapore. Although there is no plan to retire the coins with the inscriptions in English that are currently in circulation, the Pilipino coins are expected to replace them eventually. It is interesting to note that after the last U.S.-Philippine silver-peso coin was issued, in 1912, 60 years passed before the reappearance of another silver-peso coin. On July 3, 1972, the Central Bank of the Philippines officially put into circulation a new silver 1 Piso (One Peso, in Pilipino) coin, bearing the profile of Jose Rizal. The new silver-peso coins were made by the U.S. Bureau of the Mint. for the replacement and demonetization of the Pilipino currency-note issue of the Central Bank of the Philippines outstanding as of July 1, 1973. These notes were to be exchanged with notes overprinted with the legend ANG BAGONG LlPUNAN on the watermarked portion. No more 1 Piso bills have been re-issued with the "New Society" currency. Only the 1 Piso silver coins remain in use. By D. TANTOCO, Jr.
You can compare our buying rate with other local and foreign buyers. Beware of other buyers buying these coins lower than their gold value. Please note the price I quoted below are just estimates and might go lower or higher depending on the gold prices of the day. Inquiries are welcome. Contact me at: lumang.gamit@yahoo.com, please send photos so I can appraise them. I get a lot of inquires about the 1975-1980 Marcos 5 Pesos coin. It worth around 10-20 pesos only, These coins are made of nickel and not silver. If you will go to coin shops and antique dealers they are selling is between 20 - 30 pesos. Thanks for your nice comment. 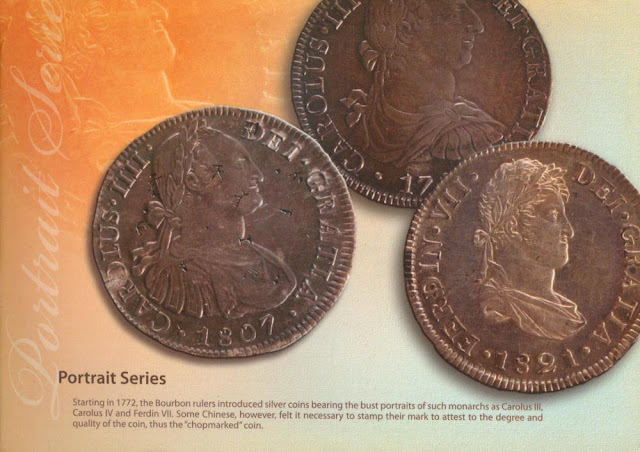 There are many coin catalogs available, the more popular ones are made by Krause publications. If you want to know the actual value of the coins I suggest that you search the online auctions on the internet. It will give an idea of the value of the coin. I hope this helps. I also collect and buy Philippine coins. If you have any questions email me at lumang.gamit@yahoo.com. Hi, I want to sell my 1991-1994 Emilio Aguinaldo 5 Peso coin,. How much is it worth sir.? I have 200 Pcs. of it. Hi Derek, my great grandma gave me a coin that reads Senor Patriarca San Jose dated 1001. In the front of the coin is San Jose(St. Joseph). On the lower left is the sun with human face and the lower right is the first quarter moon with 5 stars. In the top most back of the coin is a triangle encased in a sun with initials T.D and Y.D.. In the middle is an angel with a trumpet and in the bottom part are crosses and the date 1001. I have been keeping this for 20 years now and I really do not know if this has value or just one of those coins. I searched every site in the internet but has found no answers. Maybe you can help me. Hi, Based on your description that is an amulet (anting-anting). The maker of that amulet used the 8 reales Mexican coins to make those. I have seen that before. Email me at lumang.gamit@yahoo.com so I can show you similar coins that were struck and made into amulets. Some numismatic dealers are selling it for 5 - 10 pesos. Some coin dealers are selling it for 10 pesos each. hi speaking of 1972 old peso coin, where can i sell it? thanks. this is my email ijolinamonica@yahoo.com or contact me 09261457479. I have a 1903s One Peso coin. It has a small what seems to be Japanese character stamped into the front of the coin next to the word ONE. Can you please tell me if this had to do with the Japanese occupation and what the value of this coin might be? Thank you. Hi Alex, Most probably that is a Chinese chopmark and not Japanese. Back then Chinese traders put chopmarks on our 1903-1905 1 Peso coins to indicate these coins are silver and genuine, because at that time these coins are being counterfeited. Hi, I have a 4 peso gold coin, isabela 2. 1867, pcgs xf 45. Do you know what is the market value of this coin? Thanks, chris. Hi. i have 1972 1 peso coins as well. Do you know where i can sell them and how much is the value. Thank you. I was wondering if you are interested in showcasing your collection (coins, bank notes, old stamps, and other memeroable items) in one of our exhibits. It would be greatly appreciated if you can contact me at bry.balatbat@gmail.com. i have one peso 1906 coin where can i sell these? hi sir im limbert ive g0t s0me 1944 coin..,how much it would cost?and 1959 american coin..,just text me if youre interested 09068328818. My name is Angelo. I have an 1877 coin which states "Trade Coin". I wonder what does this mean. Would appreciate if you could lecture me on this. If its worth any value, I plan to sell the said coin, together with my 1908 One Peso coin, 1917, 1918, 1921, 1944 and 1945 Fifty Centavos. How much is the value all in all? Many Thanks! The 1877 US trade dollar is worth around 3,600 or more depending on the condition. Japanese WWII money are quite common. I have attended the Greenhills antique and dealers are selling them between 10 - 20 pesos each. The other coins listed are not yet valuable. hi can i know the value of 1907 and 1921 fifty centavo coin? with the united states on the reverse? Around 250 peso might worth more if in extra fine to uncirculated condition. Those 5 centavos coins are quite common. I have attended the Greenhills antique and dealers are selling them between 10 - 50 pesos each. thank you for the saving image of the peso bill now i can see. I hope many like me i can see that . thank you! I estimate it to be 50 - 150 pesos. Might worth more to some collectors. 1 peso 1903 is worth around 1000 - 1800 depending on the condition of the coin. Might be worth more if it is certified or it is in mint state. I also have these coins, can anyone share with us, kung magkano po itong mga ito? SALAMAT!! Try attending Bayanihan Collectors Club visit their facebook page and see if there is any coming event. I have One Peso silver coin the same as what you have (1903) but was minted 1909, it was given to me by my grandmother in the early 70's. I wonder if there's a value and how much would it be.. I am not a collector, but thinking of selling it. I'd appreciate your advise.. thank you very much. At the current rate it is between 500 - 600 pesos. A year ago it is 700. The prices of this coin is based on the current silver market unless the coin that you have is in mint state then it will command a higher price than what I have quoted. The Japanese occupation money is not worth much. They are called "mickey mouse money" because they are like play money, millions of these notes were printed during the war. They are worth between 5 - 10 pesos today. There are stores in Greenhills and SM Megamall, Ortigas that sells them at 20 pesos each. hi! how much will u buy the 1909 peso coin? hi i have 1 peso coin year 1972 & 1974 and a 5 peso coin year 1975. how much will it cost if i sell them? Some coin dealers are selling the 1 peso coin year 1972 & 1974 for 10 pesos each. The 5 peso coin year 1975 is around 10 - 20 pesos. Baka may gusto po bulimi ng coins ko na 1972 &1974 na 1 peso, marami po ako. Just text me @ 09175328264.
hi .. i have a senor sn jose patriarca 1001 silver coin . how much will it cost if i sell it ?? I think that is a Silver amulet not a coin. Email the picture to lumang.gamit@yahoo.com so I can estimate and give you a better insight about that coin. i have some spare, a 1919 ten centavo silver coin,1945 five centavos,etc..the earlist is 1994..
i have 5 yen 1969 to 1944 ,25 and 10 centvos philippines coins 1960 to 1964 ,portuguesa escudos,mexicanos 50 cents,north african coins,italyano 100,venezuela of north america libertados,singapra,egypt coins,100 fils of jordan,france 10 centimes,and others. .i just want to ask,if how much would it cost now?? ?if you are interested..
is there a shop or people who buys any old coins somewhere in manila area? Hi! I have one peso old coins year 1972-1975 five pesos as well(156 pcs.). If anybody is interested to buy just pm me @ jacqueline_david@rocketmail.com. how much is this coin ONE PESO FILIPINAS 1903?? Around 900 - 2000 depending on the condition and the silver market price. If it is in UNC condition it is worth more than the quoted price. hello derek, just read your article. Indeed, very helpful since I have a bagful of my mom's "treasure" chest -- a lot of 5 centavos in 1903, 1907~1918, 1936~1945. I have also 1 peso 1982 with bagong lipunan inscription with pres. marcos profile. Appreciate if you can send me a valuation of these. In most of the general population’s mindset, there is no real variation in exactly what these two terms actually signify, and are quite often used in identical circumstances. However, to a knowledgeable coin collector or coin dealer, they represent completely different things. my grandpa owns twenty pieces of the 1907 proof version of US-Philippines One peso silver coins. He sold one in the US auction and fetch around 250 thousand US dollars. This is the reason wny I started collect coins. You are a very lucky guy to own one. I have not seen one in person, I have seen it only in auction catalogs. i have a us-one dime...(mercury dime) dated 1943.. how much this worth?? i have also an one peso coin dated 1903 in good condition... how much it's worth?? Around 1000 - 1800 depending on the condition. If it is in UNC or BU state it would fetch higher. It range from 1.5k to 3k depende sa grade niya. Average price is between 2500 - 4000 depending on the condition. If it is in mint state it would fetch higher. hello!gusto ko po sana malaman ang value ng philippines two peso bill 1944 si jose rizal ang nkalagay n picture at my victory sa likod?at philippines one peso bill 1949 si apolinario mabini nsa pic s harap barasoain church nmn ang nsa likod?thank u! The 2 pesos Rizal Victory note is worth around 200 - 800 depending on the condition. The 1 peso Mabini 1 peso English series 1949 is worth around 10 - 70 pesos depending on the signature combination and condition. anyone interested to buy US 1913 liberty head nickel at negotiable price. how about the 5-peso year 2000? i heard they minted a few in mindanao. there's none in circulation though. try it! hello.. im daryl from paranaque im selling my 32pcs 10peso uncut bill.. if your interested please call or text 09069477279 thank you..
Hello, I have a Ferdinand and Imelda Marcos 1965 inauguration medal. I want to sell. what is the value? Hi gooday .may halaga pa ba o nabebenta ba ang 2 peso and 5 peso paper bills . Thankyou . how much the coins 5cents 1944 and 1945.and 1cent 1926? The 1944 and 1945 are common dates for the US-PI coins, depending on the condition it is worth between 5 - 50 pesos. The 1926 1 centavos is worth between 100 - 900 depending on the condition. gud eve po magkano po ung 1 centavo coin from year 1919 to 1945 at ung coin of spain ISABEL 2 4M year 1855 salamat po. Can you send a photo at lumang.gamit@yahoo.com, so I can estimate. anyone who are interested to buy a 10 centavo phil. paper bill under the presidency of Ramon Magsaysay? Would you be kind enough as to take a look at my coin photos featured in my blog (www.jerrysitems.wordpress.com) so you could tell me if they are genuine or fake? They are part of the heirlooms given by a close relation and I am thinking of disposing them of. Thanks. Those are quite common around 8-10 pesos if they are used or circulated. In mint / uncirculated condition around 20 pesos or more. sir i have 1949 20 centavos banknote and 1949 jose rizal 2 piso banknote how much do you buy it?? thank you!!! sir i have 200 pieces of 1944/45 50 centavos. how much do you think all of them are worth? i search and they have high silver content so do you think itll be more valuable to turm these into silver? I also have what looks like an amulet, a few leper colony coins that look like plastic, a pin and pendant with Aguinaldo's likeness, a small ivory bust of Aguinaldo, and a pin of an old revolutionary flag of the Philippines. Anyone interested can text me at 0933-1996354. Thanks. hi! i'm helping a couple of students at my school with their project to have current asian coins from every asian country. where do you think can we go to get some? hi, meron po akong 10 peso bill na Japanese government at 20 centavos na 1949, magkano po kaya yon pag binenta? pakisend nlng po sa email ko ang sagot. I understand that this post talks about Old Phil. coins & banknotes, I wonder if you could help me look for articles from the net about antique Phil. bottles. I've been searching religiously; sadly, I couldn't find any. Perhaps, Sir Pinoy Kollektor could extend his expertise about "lumang gamit" and stuffs. mayron po aq 1piso araw ng kagitingan 50-anibersaryo 1442-1992 mgkano po ang value?may number is 09092419355. I ASK IF THE FOLLOWING COINS HAVE VALUE AND IF YOU INTERESTED EMAIL ME @ bhackuz2@gmail.com thanks ..
That is a nice coin, I hope it is authentic because there a lot of fake Pillar coins now a days. Not worth much, it is still common. we noticed that the words REPUBLIKA NG PILIPINAS does not show on the coin, although Rizal's Face show. On the reverse side of it, the logo is seen but the words Bangko Sentral Ng Pilipinas is nowhere to be found. The coin does not show any scratches just to erase them. Looks like a coin error to me. In this case is it worth anything? ---"would like to advise you on this numismatic coin engraved with the face of M. Antonio one part and the other part of Cleopatra. part of Cleopatra (more or less under its neck). said that it is silver. The AXIS CONIO is at 6 o'clock. please reply if your interested. Know pls how much this coin is? Francaise 1978 20 centavo gold coin. Meron akong coin 25 cent 1966, 20cent 1944, 5cent 1930, 5cent 1944.5cent 1945 and 5cent 1903, mag kano kaya value nito ngayon? txt me 09081802835 im from davao city. 1909 US-Philippine 1 peso - 380 - 500 or more if UNC condition. I have 1907,08 ,09 1 peso coin . Magkano nyo po ito bblhin? hi im jackie from laguna itatanong ko lang po magkano value ng mga coins ko..
i have 1945 Five Centavos Coin U. S. Administration Philippines. hm is this? This is quite common date. Coin dealers are selling it for 50 pesos or more depending on the condition. It is worth between 380 for fine condition - 800 for Almost Uncirculated (AU) condition. Anung malaysian ringgit hanap mo 50 20 10 5 cents....? Hi pinoy kolector, I have "alfonso XIII 1878 10c silver coin" and "Isabel 2 1868 50c silver coin", please give me the idea of the price of it. i have 100 pieces of philippine 5 centavo coin from 1911 to 1944. magkano kaya pwede maibenta lahat yun? package deal. any ideas guys? sir pki open po ang abe reyes fb nka polo po ako na pang hawaian na my hawak na camera meron po akong mga spanish 1 quarto na kabilang sa mga rare coins madami na po akong nabebenta pg napunta ako sa auction naghahanap pa din po ako ng mga buyer na pwede kung pagbentahan ng mga collectable coins ko na ms mataas ang presyo. ito po ang no. ko 09217379999. Magkano po kaya ang value ng 2 peso banknote 1928? I think that is a 1929 2 pesos Treasury Certificate and not 1928. It is worth between 400 - 2000 depending on the condition. There are just estimates without seeing the note..
Have heard that a documentary about the 1975 5 piso coin under Marcos regime that it's made of white gold..I am as well a coin collector but my purpose of collecting it is to frame it...so I kept my 5 pi so coins in safe place..silly but how much its worth?? I get a lot of inquires about the 1975-1980 Marcos 5 Pesos coin. It worth around 10-20 pesos only, These coins are made of nickel and not silver. If you will go to coin shops and antique dealers they are selling is between 20 – 30 pesos. Mag kano po tong mga coins ko dto 1979 queen elizabeth the second hongkong 1 dollar, 1962 25 cent philippine,1989 50 cents singapore, 1979 10 cents malaysian,2005 10 cent euro, pki replyan po ako please how much mga yan. magkano po ang fifty centavos, 1944, may logo ng USA and Pilipinas? This is a silver bullion coin. 2 years ago the going rate is between 300-400 pesos, now (April 21, 2014) it around 200.00 pesos. The prices of gold and silver went down by 30-40%. So if the prices of silver goes up again, try to sell it ASAP, remember what goes up must come down. nabasa ko yung price value mo sa old coins. May 5 pieces 1975 1 peso coin ako at gusto ko sanang ibenta sa iyo. contact me at 09169722941. Hi, I have (8)pcs of fifty centavos 1964 coins, (1)pc of 5peso Ferdinand Marcos 1975 coin, (1)pc of 1peso 1972 coin. hi mr. pinoy kolektor, i have a 50 pesos gold coin 37.5 gr. Oro puro 1821-1947 estados unidos mexicanos, do you know how much its worth? hi tatanong ko lang kung may value ba ang mga coins ko? please email me ijolinamonica@yahoo.com or cantact me 09261457479 if meron pa silang value o wala na. kasi balak ko pong ibenta f may value pa i got 30 pcs po kasi of 25 cents. 5 peso (Marcos) Ang bagong lIpunan.